Soup is something I make quite often during the fall and winter months, but this likely would be hard to guess about me given I don’t post about soup very often. The last soup I shared was pumpkin soup, and that was easy to associate with our Halloween and Thanksgiving traditions, but the truth is, I think I’ve avoided posting about soup because there’s a significant reason why I started making and enjoying soup. Starting with this tortilla soup recipe. I often make soup one night a week. It’s perfect for cold Southern Californian weather, and it’s great for when we’re sick, which unfortunately we are still continuing to trade colds in our family. “Soup night”, I suppose, is equivalent to what my parents called “stew” night when my brother and I were growing up, but the reality is that they were feeding us “chicken soup” for dinner. :) I’m not complaining. I liked our “stew” nights. I’m guessing the word “stew” is something that was lost in Japanese translation from my first generation Japanese Mom. Stew by the standards of Japanese culture, and my Mom, refers to most anything boiled with some broth, but this is not to be confused with Japanese nimono. Oden is also considered a form of Japanese “stew” but in our home, “stew” also referred to American chicken soup and my Mom’s Japanese version of American beef stew which had a thin broth and more closely resembled beef soup. Regardless of the Jenglish terminology, I loved my Mom’s “stew” and often enjoyed it by adding rice to my soup bowl. For the past two to three months, I’ve been making my usual fall and winter soups that I’ve made annually for the past seven years or so but I thought I would finally start sharing my favorites. The first one, the one I make quite often, is tortilla soup. I’m not sure when my love for tortilla soup began, but I have a feeling that it started, of all places, at California Pizza Kitchen (CPK). I know, I know… why, of all places, CPK!?! Honestly, tortilla soup seems to be one of those soups that can be found at most Californian-cuisine, Tex-Mex, American bistro, or Americanized Mexican restaurants, so I don’t think that it’s too odd that my love for tortilla soup began at CPK. When did I start making tortilla soup at home? Truth is, I never made soup very often, until I was diagnosed with a rare digestive disease known as achalasia. Yes, Bebe E, this is the post where Mommy shares her rare condition and raises awareness about achalasia and why I eat SO slow. Ultimately, I needed surgery to treat my achalasia symptoms, and post-surgery I was on a liquid diet for 6 weeks. During the later part of my liquid diet I had regained my strength and with the help of my parents I was able to make and eat foods that were pureed and one of my favorite pureed foods was tortilla soup. It was packed with flavor, fulfilled the “liquid” requirement and it brightened my otherwise challenging recovery. Achalasia is an extremely rare disease, believed to be an autoimmune disorder, as I was informed by my specialists at UCLA back in 2004. I was told that the year prior to my diagnosis, there were 25 cases of achalasia in California (a state with a population of 37 million). Certainly, there might have been those who were suffering from the disease but hadn’t sought a medical diagnosis. At any rate, according to my specialist 25 cases a year among the population of California makes the disease quite rare. Nationally, is is estimated that there are 1 in 100,000 incidences of achalasia. It cannot be cured but if it is properly diagnosed it can be treated. The disease in a nutshell, is where peristalsis and the esophageal sphincter cease to function normally, and stops allowing both food AND liquids to pass on to the stomach, essentially creating a sensation of food and drink being “stuck” in the esophagus. I can attest to the fact that it’s not a pleasant feeling and it resulted in my eating very, very slowly. The disease was fairly advanced before I realized that something wasn’t quite right and I sought medical attention. Even then, the first gastroenterologist I saw, who shall remain unnamed, did not diagnose my condition. I wasted about two months with this doctor until I found a specialist at UCLA who diagnosed my condition within a week after a simple upper GI barium-swallow x-ray. I was quite the rock star with my achalasia diagnosis. The day my specialist at UCLA gave me my diagnosis, I was of course shocked and frightened, yet at the same time relieved that the disease was not life threatening although it was something I would need to live with for the rest of my life. My doctor tried to cheer me up and told me that I would be OK. He shared with me some of the statistics about achalasia indicating its rarity. He told me that most gastroenterologists go through their entire career not having diagnosed one case of achalasia. In retrospect, this made both of us, in some ways, famous, I thought to myself. My specialist asked for my permission to share my medical case, anonymously, with a group of colleagues he met with on a monthly basis to discuss rare and unusual conditions for both educational and consultative purposes. To my benefit, the specialists would be able to weigh in on my diagnosis but my case was pretty straightforward. There are three options available for relieving the symptoms of achalasia: botox, medication, and surgery. While I was on medication to relieve symptoms of reflux caused by the disease, medication was not an option for actually treating the achalasia. Botox is used as a temporary relief for elderly patients who are not viable surgery candidates. Unfortunately, surgery was my only real option. For a girl whose never had surgery, it was frightening, I was a nervous wreck and until I had my surgery I was also ill with bronchitis all the time due to complications from the disease. Sounds strange but pneumonia (bronchitis is a precursor to pneumonia) can result from achalasia. I was fortunate that medical advancements allowed for laproscopic surgery through a mere five incisions, versus cracking my chest open which is how things were done back in the day. Overall, the experience made me a stronger person. It was during my recovery whilst on a liquid diet that I discovered a newfound love for soup. I made a GREAT number of soups, pureed them all, and happily enjoyed each and every one of them. In hindsight, all my fears about my disease were ridiculous. I had one of the best surgeons at one of the best hospitals in the entire nation. I have the best family and friends who were and continue to be supportive. All of my fears and vanity about scars were completely ridiculous. My husband, who was my boyfriend at the time, was my rock, and it was during my stay in the hospital while at my side that I knew that he was the one that I would spend the rest of my life with. My brother stayed with me at the hospital during and after my surgery, and one of my best girlfriends came and sat by my side as I lay motionless, exhausted and in pain in my hospital bed. My parents took great care of me during my recovery and ran multiple errands to the supermarket as I creatively thought of one liquid food after another which I could “eat” with the help of my blender. Another one of my best friends helped me to get to my post-surgery appointments and I had many wonderful friends who came to visit me at home and kept me company during my recovery. Many thanks and love to all! 1. Roast red pepper until skin is charred, cool 5 minutes and and remove skin and seeds. Dice. Grill corn if you prefer, but I usually just slice the fresh kernels off the cob and add them to the stock pot as a short cut. 2. In large stock pan, heat oil, add garlic and add onion. Next add chicken to the pot and sauté, seasoning with poultry seasoning, cumin, salt and pepper, until light brown on each side. 3. Add diced zucchini, chipotle peppers or green chiles. Cook with chicken about 5 minutes. Add canned tomatoes, tomato sauce and stock. Add corn and red pepper. Bring soup to a boil then reduce heat to medium low. 5. Remove about 1/3 of the soup into a large bowl and allow to cool. Using a hand blender, puree the soup. Add this back to the stock pot. This adds great texture to the soup. Love it! NOTE: If I am in the mood, I will sometimes add a can of white bean or black beans to the soup, after I’ve pureed a portion of it. Beans add great fiber and I love adding them to soup. 6. Scrape corn off cob and add to soup. Chop grilled red pepper and stir into soup. Add chips to soup in handfuls and fold in. Serve soup immediately with scatter of shredded cheese and a dollop of sour cream. Top with any or all of the suggested garnishes. 7. Occasionally I will fry my own tortilla strips using old corn tortillas that I have in the fridge. The key to making tortilla strips is thinly slicing the tortillas and then lightly salting them after they’ve been fried. 8. Garnish your soup with tortilla strips and any of your favorite toppings. 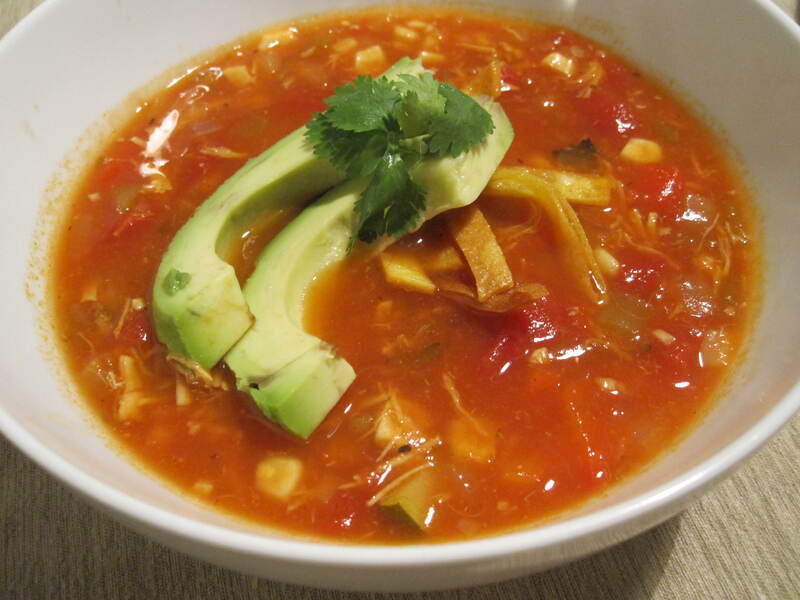 We usually garnish our tortilla soup with avocado, cilantro, cheese and tortilla strips. Achalasia. The story behind my favorite tortilla soup recipe and how I came to make this wonderful, delicious soup. You can take my word for it that it tastes great completely pureed if you ever have a need for a liquid diet menu idea. Otherwise, enjoy the soup as we do, quite often during the cold winter months. It won’t disappoint. This entry was posted in Chicken, Family Favorites, Soup and tagged chicken and corn tortilla soup, chipotle adobo peppers, green chiles, Tex-Mex soup, Tortilla soup by Judy | Bebe Love Okazu. Bookmark the permalink. I remember when we used to go to lunch together and you ordered tortilla soup at CPK. I think you were the one that introduced me to this soup. It’s quite tasty and I did enjoy it. Sometimes a lil too spicy for me when ordered at restaurants, but otherwise a very yummy soup! I love the tortilla strips that are sprinkled on top! Well, enjoyed reading the blog! Keep up the good work! Thanks friend. :) That’s funny you remember that I used to order this at CPK! Good times!!! Wow, you’ve been through a lot. This is an awesome post. Thanks for sharing it. I had never heard of achalasia, though I have spent many hours listening to various different types of surgeries etc., with my mom being a nurse for 30 plus years and my sister in law and brother being doctors…. How lucky that you were in a large city where you could have the best treatment, and to have your family and close friends there to support you!! Glad you are well now and you are able to live with it and eat anything you want! They say it is much healthier to eat slower anyway. My mom has always been a slow eater, and I’ve always admired that. I think you can be more aware of your food and enjoy it more when you eat slower. Also you realize you are full when you actually are full. If you eat too fast, you don’t realize how full you are until after you’ve stuffed yourself. It is great that you are able to see everything in such a positive light. Wonderful post! !